UPDATE: On Tuesday evening, the Keystone XL pipeline bill failed to break a Democratic filibuster in the Senate. The bill needed 60 votes to clear the procedural hurdle. It got 59. Expect the issue to return when the Republican Senate majority is seated in 2015. Is political love in the DC air? If you think so, you must be inhaling something else besides air. 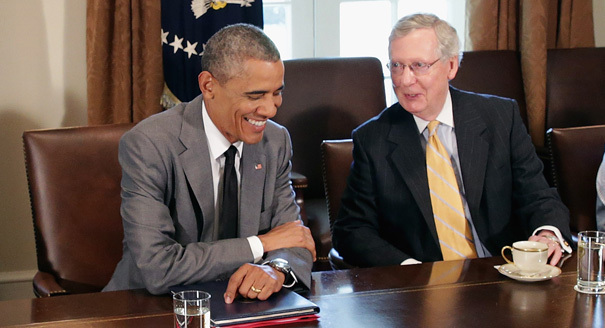 True, both President Obama and newly anointed Senate Majority Leader Mitch McConnell paid lip service to bipartisanship and compromise in the aftermath of the midterm elections. But most of us intuitively suspect that Republican gains in Congress will mean more conflict between the two parties, not less. With that in mind, here's a tip sheet for some of the points of conflict you can expect during the last weeks of 2014. 1. The Keystone XL pipeline. The Senate runoff in December between incumbent Democratic Senator Mary Landrieu and Republican Bill Cassidy has forced the issue in the lame-duck session, as both candidates in the unsettled race jockey for support in conservative Louisiana. The House has voted for the ninth time to force approval of the project, with the Senate expected to take the issue up this week. President Obama has argued that approval of the project should wait until a full review by federal agencies is complete and legal disputes over the pipeline within Nebraska are settled. He has also said that he won't approve the pipeline if he thinks it will contribute significantly to climate change. But red-state Democrats in the Senate may join Republicans and vote to force the president to take a clear stance. What will happen: If the pipeline makes it out of the Senate, President Obama will likely flex his political muscles and veto the bill. There is almost no chance that Landrieu will win her runoff either way, and buckling to Republican pressure now will confer no political advantage to the president. The pipeline could serve as a useful bargaining chip for the administration later on. 2. Immigration reform. In response to the GOP's apparent unwillingness (or inability) to pass reforms to address border security and the fate of undocumented immigrants in the US, President Obama has long promised to take aggressive executive action to ease the burden of deportation on the immigrant community. The Republican victory in this year's elections does not seem to have shaken the president's resolve. Expect a big policy change on immigration from the White House in the coming weeks. What will happen: Republicans will be furious with the president for using executive power to slow deportations, but ultimately the party will be unable to escape their immigration inertia and craft a legislative response. Speaker Boehner will be a bit relieved, as the pressure on the House Republicans to act will be lessened while the GOP can attack the president for overstepping his authority. The impasse over immigration will sour everyone's taste for compromise and make another shutdown more likely to occur. 3. Shutdown 2014? The continuing resolution which funds the federal government will expire on December 11. After their win in the midterm elections, Republican leaders were careful to emphasize that they were not interested in a repeat of the 2013 shutdown debacle. But executive action from the White House on immigration might inflame the more reactionary members of the Republican caucus. Republicans could attach language to a new funding bill prohibiting the president from exercising discretionary authority for deportations, initiating yet another budgetary standoff with the administration. What will happen: Republican leaders in Congress will be nervous to trigger another government shutdown just weeks after their decisive electoral victory. But if recent history is any guide to us, it may not be within Speaker Boehner's or Majority Leader McConnell's control if shutdown frenzy infects the GOP caucus yet again after President Obama acts unilaterally on immigration reform. Though last year's shutdown was a disaster for the GOP politically, the memory of the incident didn't seem to be a liability for them in the 2014 midterm elections. But Republicans will probably agree to a short-term extension in the continuing resolution, punting the issue out of the lame-duck session into 2015, when the new Republican Senate majority is seated. Once the Republicans have more leverage in Congress with control of both houses, they may feel emboldened to play shutdown roulette once again.